Ocean Eleven has daily housekeeping and a rooftop deck. I love how the marina and the ocean surround the villa, and the rooftop deck is the perfect place to take in the view. Inside, everything is sleek and modern, but still warm and comfortable. Sits on the marina in Cap Cana! 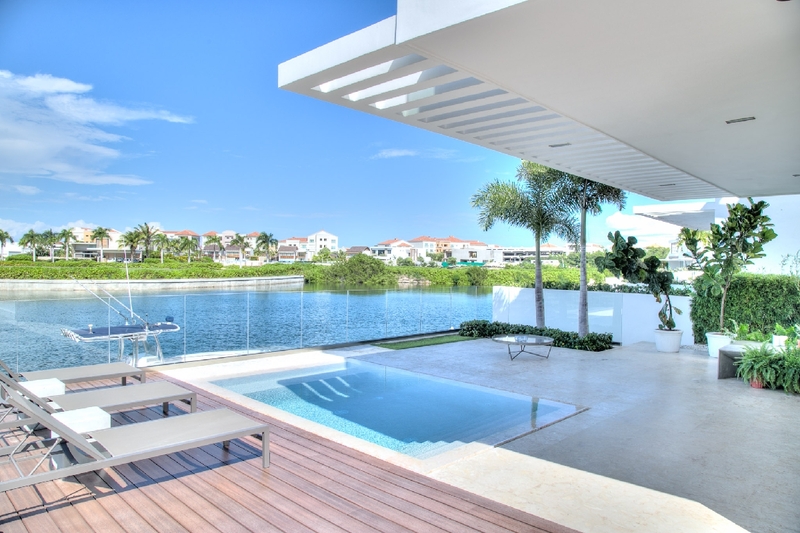 Ocean Eleven is a modern villa in Cap Cana. This avant-garde, three-bedroom rental offers unbeatable ocean and marina views and a rooftop deck. This minimalist villa is ideal for anyone who loves fishing, exploring, or sailing. On the rooftop, there’s outdoor living space, a BBQ area, al fresco dining, sun loungers, and a heated jacuzzi. On the lower level, there’s a wooden deck with a plunge pool, sun loungers, and a glass railing. Gorgeous, green foliage surrounds the pool deck and its cocktail bar. Around the corner, there’s more al fresco dining and living space, as well as a large grilling area and a Jacuzzi. Sliding glass doors lead from the pool deck to the sleek interior. Inside the living room, there’s plush furnishings, a flatscreen TV, a library, and a dining table. The fully-equipped kitchen has a quartz countertop and stainless steel appliances. All three bedrooms are on the second floor and have ensuite bathrooms, TVs, and floor-to-ceiling marina views. The first suite has a king bed, the second has a queen bed, and the third has two queen beds. The ensuite bathrooms have walk-in showers and deep basins. Ocean Eleven is in Cap Cana, an exclusive gated community near colorful coral reefs, calm waters, and white sand beaches. Natural water pools are a 7-minute boat ride away in front of the Westin, and Eden Roc’s beach club is 15 minutes away. Juanillo Beach is ten minutes from the villa as well. Juanillo Beach is a 10 minute car ride, and Eden Rox Beach Club is a 13 minute car ride from villa. Transfer to and from the Airport, access to all of the resort amenities, fruit basket upon arrival, private check in, and welcome beverages. Use of boat with captain for offshore fishing (rates upon request), Car rental, butler, server, grocery and beverage shopping (pre-arrival and during your stay), liquor and wine delivery, golf cart rentals, nanny service, baby equipment, spa services, yoga and personal training, and photography can be arranged for an additional fee.